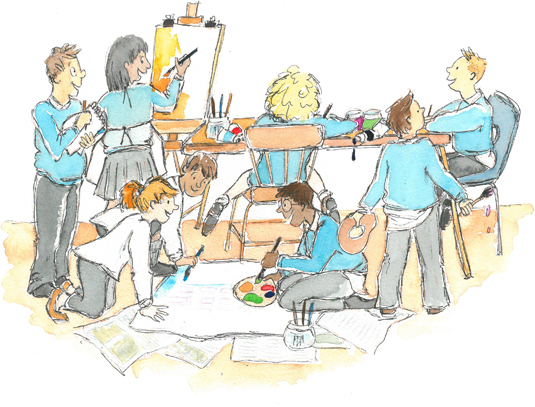 We can provide Art workshops for classes, clubs or groups of all ages, tailored to suit your budget and requirements. We can also assist with staff training, provide workshops for INSET days or staff meetings, and deliver a range of Art workshops for parents and children at community events. If you are looking for artwork in or around your school, we can design and produce both interior or external murals, working with or without the children as required. Where possible, we like to involve the children in all stages of production, from the original designs to creating the mural and adding the final touches, giving them ownership and an understanding of the artistic process. All of these workshops and projects can help your school to achieve ArtsMark or your children to achieve ArtsAward. Exciting scenery can add the professional touch to your school production and help inspire the children. We can work with or without the children to design and produce backdrops and props that will help give your show the WOW factor. Involving the children in these aspects of theatre design can enhance their experience, whether for an in-house production or event such as Rock Challenge.